^^ Top: J.Crew | Skirt: Mark D. Sikes | Sandals: Schutz (also here) | Earrings: Sachin & Babi ℅ | Lips: YSL #7 lipstick and Soar liner by MAC | Isla’s Dress: Wren and James | Isla’s Shoes: Mini Melissa | Isla’s Bow: Wunderkin Co. Happy Tuesday, everyone!! We are heading home today after a fun weekend in California! I had some meetings to go to in LA and last minute we decided to make a family trip out of it, and I’m SO glad we did! Isla and Jackson loved going to the pool and playing on the beach. 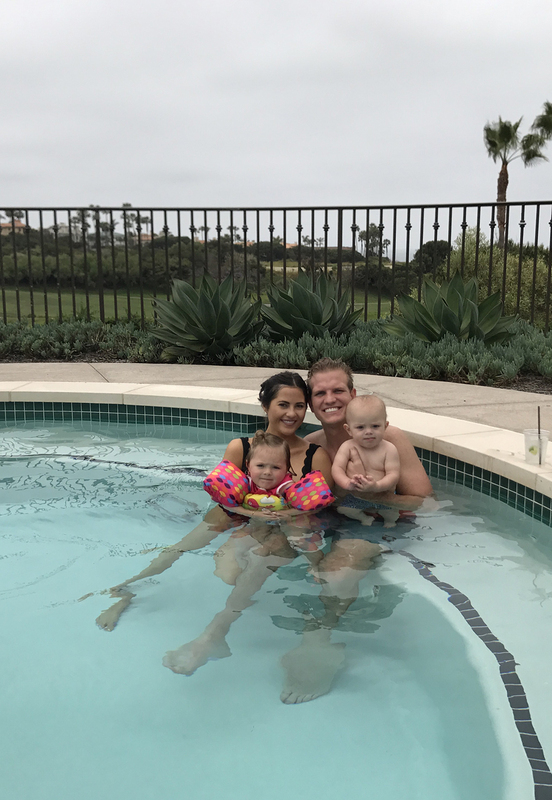 We stayed at one of our favorites, the Monarch Beach Resort! It’s super family friendly and such a good location. 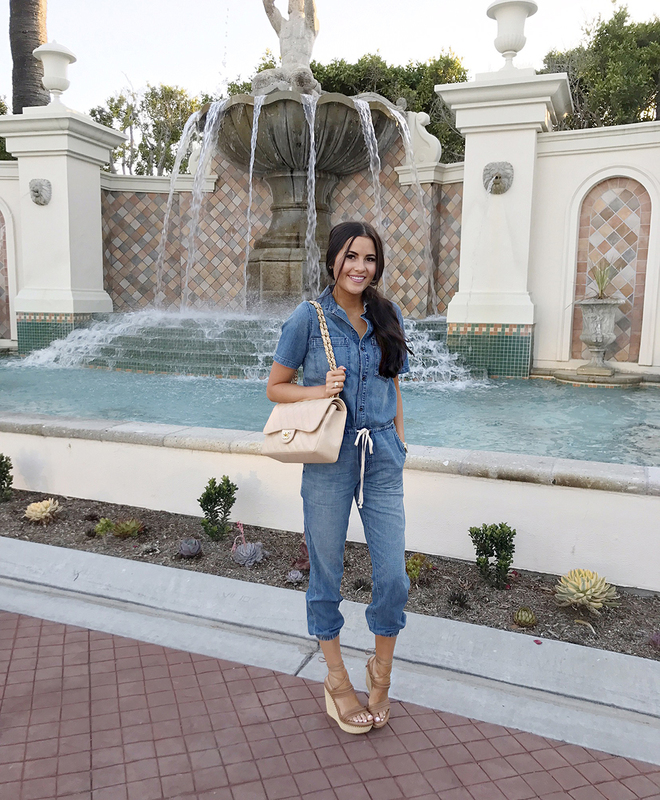 So today I thought I’d share a round-up of some of the outfits I wore while in California!! It has been a quick, fun trip but we are ready to be home with our Dasher boy! 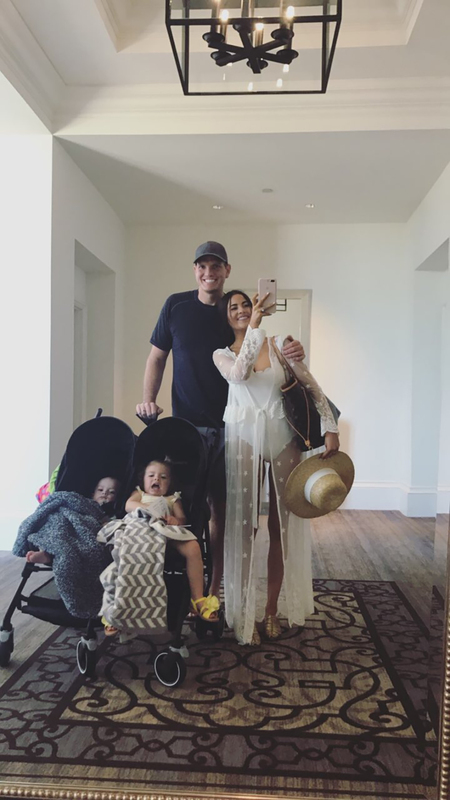 Your family is so beautiful, loved this! I really love that anthro jumpsuit you wore! So cute! You are such a sweet family! I’m loving this photo diary! You always have the best selection of swimsuits, Rach! I adore them all, especially the last one with the pink ruffles, too cute! I also love both coverups and that denim jumpsuit is too cute as well. Okay, so I basically love everything, lol. Thanks for sharing, girlie, and I hope you have a lovely day! I love the long white coverup- I can’t believe it’s only $20!!! I know!! Seriously, such a good deal! So beautiful! Love that orange kimono and the jumpsuit! Looks like it was a great family trip. Great looks. Can you share what polish you have on your toes? Thanks! Let’s Be Friends by OPI! Rachel, what size did you get in the white Romwe coverup? Also, love the toenail polish you have on. What brand and color is this? Thank you! I got a XS!! And my nail polish is Let’s Be Friends by OPI. Looks like such a fun trip! Love all of the swim suits!! So many gorgeous looks! I love the ruffled swim top and geo-printed sarong! Love all your looks! Those bathing suits are fabulous! Looks like a great time! I was just in California a month ago. Coronado Island is amazing,you should go! Eat at Miguels Cocina (the best Mexican food I have EVER had) and walk over to Coronado beach. It’s the best. 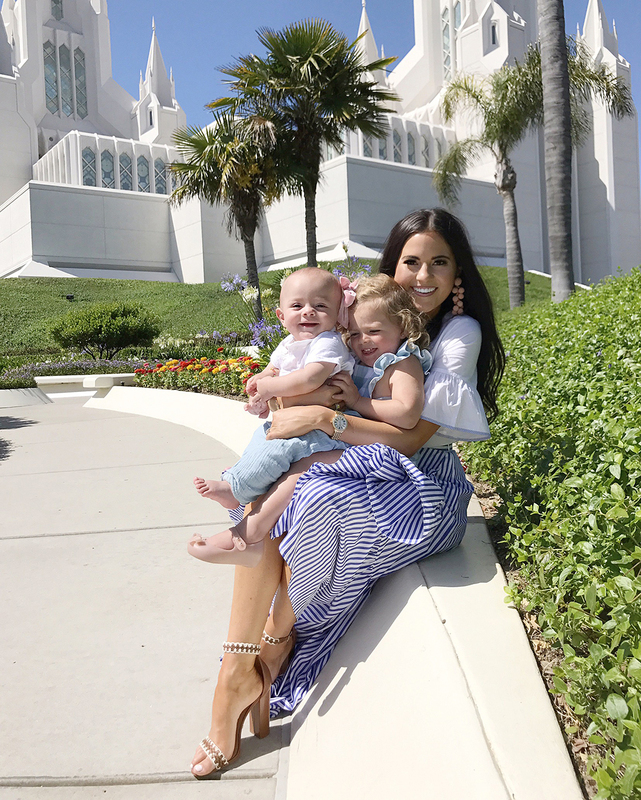 And how beautiful is the San Diego Temple. It was my first time going. I love the picture of you with your kiddos there. Enjoy!!! Love all your looks but the kimoni from Romwe and the pink ruffle bikini are so beautiful!! You have the best poolside style! Also, I totally ordered a knock-off of your gold flats and I can’t wait to style them! You’re going to love them!!!! I seriously wear them everywhere! Loving all of these looks, especially the one with the denim jumpsuit! I am so bummed I missed you! I live in laguna and was visiting Monarch Beach this weekend. I love this post, thanks for sharing with us where we can buy all of your outfits. You are so stylish and such an inspiration!! I love all of these looks! Looks like you had a blast! Oh no!! Hopefully it will be restocked soon! These are all so gorgeous!! I love your swimsuit coverups and that pink ruffle bikini top…and that striped skirt!! So beautiful!!! I just have to say you are absolutley amazing, I buy everything you wear! As a new mom of 2 as well, I would love to know what Marysia one piece you recommend?? Shana you are so cute!!! Thanks for leaving such a sweet comment :) I love these Marysia one pieces. Hope this helps!! (http://rstyle.me/n/cnqf88jane and http://rstyle.me/n/cnqf9jjane). I really want all of these looks! So cute!